This delicious latte is cold-brewed with refreshing maple water for natural sweetness. Edible organic rose petals add a beautiful touch that is sure to impress guests. Pretty fancy for a latte! Grind your coffee on the coarse setting, or use pre-made coarsely ground coffee, like this one. Place coffee in French press or glass container or your choice. Add the maple water and the vanilla extract. Stir gently and steep in fridge or on counter for 12-18 hours. If using a French press, push down the plunger to strain the grounds. If not using a French press or brewer, use cheesecloth or a coffee filter to strain your grounds. If using cheesecloth, strain 2-3 times to remove any murky residue. Transfer cold-brewed coffee to large glass pitcher. Add ice directly to pitcher or in glasses (or both). Add a small dash of rose water if desired. Add the condensed milk to taste and stir gently. 1-2 of condensed milk to every 8 ounce cup of coffee should suffice. Add slowly and taste test along the way. Garnish each glass with a sprinkling of rose petals and serve. If you’re limiting your sugar intake, you can also substitute organic non-homogenized whipping cream for the condensed milk as the maple water will add a light sweetness. And if you're vegan, you can substitute condensed coconut milk. During the cold weather, this recipe can also be prepared hot. Just pour boiled maple water over medium-fine coffee grounds. 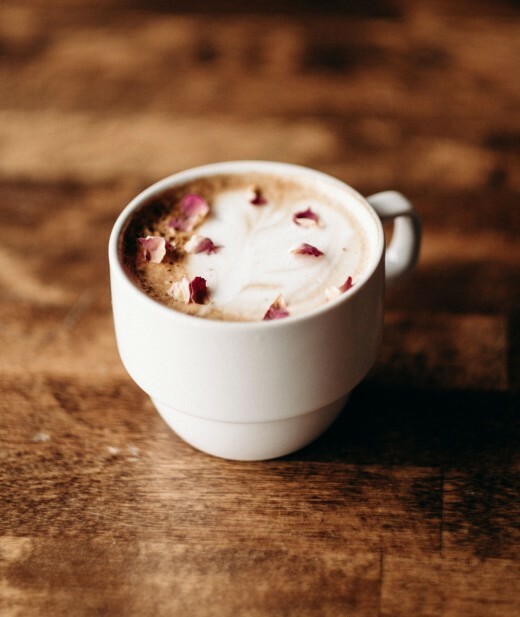 Mix in condensed milk or frothed cream, add vanilla extract and garnish with rose petals.